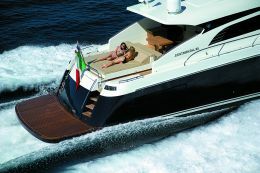 Love for the sea and fast cruisers led a top Roman businessman to set up CNM, acronym of Cantieri Navali del Mediterraneo, which debuts on the market with a product of no half measures: the Continental 80. Full load displacement: 53.000 Kg. For information: CNM - Cantieri Navali del Mediterraneo, Via Mario de' Fiori 42, 00187 Rome; tel. +39 06 6783699; e-mail info@cnmspa.com. Passion for the sea and boats are the more than valid reasons why Roman entrepreneur Salvatore d'Agostino, president of H1 Holding Spa, established a new brand name in yacht building. And he didn't choose a simple sector such as small pleasure craft but plunged right into a niche territory where absolutely no mistakes can be made: large 24 metre plus yachts. 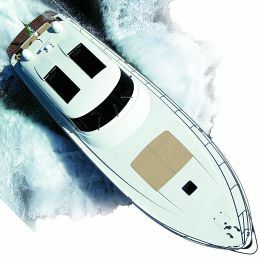 In a market crowded with keen competition CNM aims at offering an alternative product to classic motoryachts, Italian and otherwise. And to succeed in this the proprietor, Salvatore d'Agostino, brought together a team of sector experts including engineer Alberto Ascenzi, member of the American Society of Naval Architects and Marine Engineers, (designer and builder of high speed vessels for the Customs & Excise Service and hulls for renowned yards such as Perini Navi, Ortona Navi and Wally Yachts); architect Cecilia Alliata Bronner, well known in the construction sector (where she developed high level know-how on the concepts of space, light and comfort); architect Massimo Paperini (who teaches at the UNICAM faculty of architecture in Ascoli and is coordinator of the Master in Interior Yacht Design at the European Institute of Design in Rome), a designer since 1980 who has to his credit racers that have won numerous national titles and three world championships; and lastly the shipbuilding manager Giuseppe Lamonica who for more than twenty years has been involved with important yards in Italy and abroad. The result of this combination of forces is the Continental 80, the first big yacht from Cantieri Navali del Mediterraneo, a fast cruiser that puts itself forward as an alternative to the numerous motoryachts on the market. At first sight you at once notice the details, wholly new yet inspired by the classic fast cruisers of the past: from the cut of the portholes along the sides to the development of the deck, surmounted by a hardtop that is technically and stylistically different from the solutions adopted for other vessels. In fact it is characterised by two upper windows that can be opened, instead of the single panel used by most builders, so there is considerable natural light inside and, when they are open, a circulation of air below. This stylised deckhouse is framed by an enveloping smoked glass windshield. 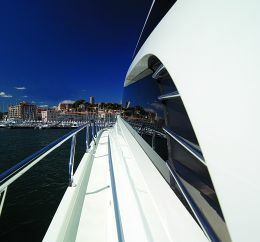 Forward it unites homogeneously with the bow where there is a spacious flush sundeck with adjustable backboard. 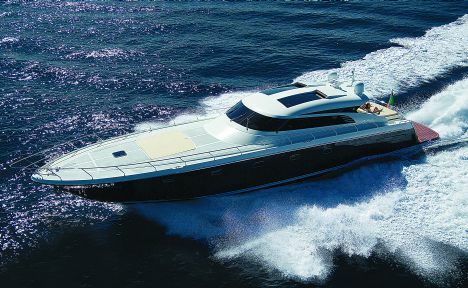 This stands out for its antiskid fibreglass instead off teak, which is used only in the aft area of this deck where there is a cockpit with a dinette and another sundeck. The former consists of a sofa and an extendable table with two items of furniture in teak, one containing the fridge and the other integrated with the access to the crew's quarters. Excellent as an outdoor dining area, it is covered by the aft extension of the hardtop, so it is at once airy and sheltered. The sundeck, set in the same structure which houses the dinette sofa and which conceals a double room for the self-inflating rafts, is positioned centrally, leaving space for two side corridors that communicate with the platform aft. 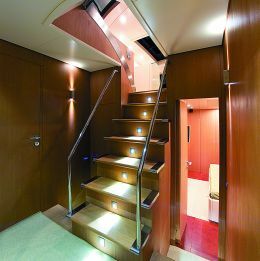 The latter, which can be reached by two stairways at the sides of the transom, offers a spacious teak surface more than adequate for swimming activities and includes an electro- hydraulic bathing ladder. The transom, as is usual, can be opened by a hydraulic system in order to access the tender, in this case a Novamarine Jet Tug handled by a counterweighted trolley. Now let's have a look at the interiors. Access is from the cockpit by means of a decidedly elegant and well finished sliding glass door. The teak flooring is so masterfully crafted that everyone who steps on board is struck by its appeal. Raising your eyes you note that you are in a refined atmosphere that can offer its guests moments of pleasant relaxation. On the left there is a long L-shaped sofa, together with a dining table and two small armchairs of modern design. On the opposite side, above a long white lacquered piece, there is a large 16.9 plasma screen. Proceeding forward, still on the starboard side, we come to a sliding door that communicates with the exterior without having to pass through the cockpit. In the forward area of the deckhouse, on the port side, the eye-catching console is inspired by aeronautical models. The cockpit as a whole pleased us not only for the layout of the numerous and clearly visible controls and instrumentation but also and especially because, over and above the two ergonomic seats for helmsman and co-helmsman, it is completely faced in hand-finished leather. The wheel too cuts a fine figure: three steel spokes with oak crown, in the style of 1970's automobiles. But the real technical peculiarity of this area, as throughout the interior, is the employment of the floating floor system, thanks to which the flooring, glued without screws onto shockproof plates, totally eliminates low frequency vibrations transmitted by the engines and consequently muffles noise when under way. 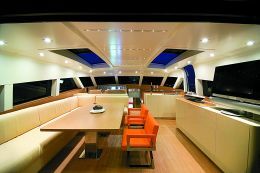 The lower deck is equally interesting, both for the quality of the boiserie and for certain small details such as LED and appliqué lighting. The owner's suite forward, which exploits the whole beam, has a double bed with drawers, lacquered streaked oak wardrobes with pearl finish, fitted carpeting with leather inserts at the bedsides and lacquered ceilings with fabric applications. As for comfort, it has a multimedia system consisting of a 20" LCD TV with decoder and home theatre, and sophisticated air conditioning. The bathroom, forward of the cabin, speaks of latest generation architecture. The floor is in black Corian and along the side walls there are two items in streaked oak complete with glass washbasins, while the WC and bidet are set in the aft bulkhead. The bathroom is completed by a shower cabin with glass door, floor in antiskid Corian and two seats for use as a Turkish bath. From the owner's zone we proceed aft. First there are two guest cabins, the one on the starboard side with a queen size bed and the one on the port side with twin beds, each of course with its own private bathroom. Then there are two corridors separated by the stairway that leads on deck. 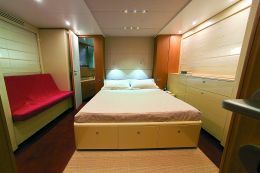 The one on the port side leads to the VIP cabin with a king size bed set athwartship while the one on the starboard side leads to the crew's quarters. Here we find a spacious galley almost entirely faced in stainless steel, with a 90 cm. pyroceramic cooktop, a professional combi oven, a dishwasher, two fridge-freezers of 170 litres each, an L-shaped work surface in Corian and a dumbwaiter communicating with the bar zone on deck. 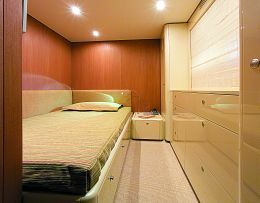 This room also includes a dining area mainly for the crew and complete with 17" LCD TV with hi-fi system. 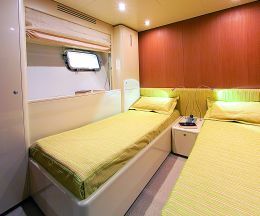 The crew's cabin has two beds flush with the walls and a spacious bathroom. 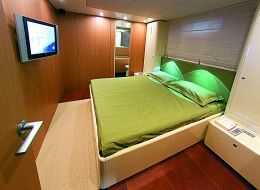 On request a third bed can be added but this would reduce the space available in the galley, The visit to the crew area ends with the laundry, set between the cabin and the engine room, complete with washing machine, dryer, stowage space and work surface. Having seen the interiors it should be said that all the spaces are coherent in their modern style, in many ways traceable to minimalism. The engine room houses two 1.825 HP Caterpillar C32's which on request may be substituted by units up to 2.400 HP which transmit their power through two Kamewa Rolls Royce hydrojets. More conventional solutions with shafting lines or with surface screws are available as options.